In the winter from December to February, the weather in Sapa becomes very cold, especially at night. In December, Sapa is cold and foggy with occasionally sunny days when the view is much better. Temperature sometimes drops below freezing point while all the town seems to be covered in ice, creating such a picturesque scene to contemplate. However, in return, visitors will have the opportunity to watch the sunrise over the valley in the morning. In recent years, there is snow in Sapa. If you have chance to travel to this picturesque town on this occasion, you will definitely see quite a romance scene. However, this is the reason why Sapa is always crowded at this time of the year. Here are some wonderful places for you to see snow that Vietnam Typical Tours give you. Sapa, Y Ty (Lao Cai) located in north-west Vietnam, at an altitude of 1,600m above sea level, is one of the places where snow and ice appears the most in Vietnam. 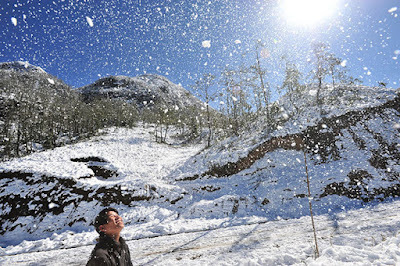 According to preliminary statistics, from 1971 to 2011, snow fell 15 times in Sapa. Most recently, on December 15, snow fell in the town of Sapa and lasted until the morning of December 16. Visitors could see snow in many areas around the town, such as the Heaven Gate, the Silver Waterfall, the Hoang Lien Son Mountain and the O Quy Ho Pass. Going further into Y Ty commune in Bat Xat district, Lao Cai, tourists will feel better the beauty of snow, which cover the roads, the villages, the forest and the mountains here. Mau Son (Lang Son) is at an average altitude of 800-1,000m above sea level, located in Cao Loc and Loc Binh districts of the northern mountainous province of Lang Son, Mau Son is one of the coldest regions in Vietnam. In winter, temperatures in Mau Son often remain minus, with ice and snow sometimes. 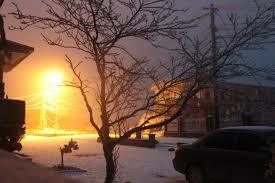 As a resort like Sapa, Da Lat or Tam Dao ... when there is ice and snow, Mau Son is covered by the white color. It looks like a Europe town with snow and ice covering French-styled mansions. Going to Mau Son, in addition to admire the unique beauty, tourists can learn about the lives of the Dao, Nung and Tay people and enjoy the famous specialties of this region, such as Shan Tuyet tea, six-spur chicken, wild lemon, frogs, roast pork, Mau Son wine , Mau Son peaches and the medicated bath services of Dao people. Tay Con Linh (Ha Giang) is at the 2,427m altitude, Tay Con Linh - the roof of the northeast mountain region – also has ice and snow in the winter. In 2011, there was snow in the Tay Con Linh Natural Reserve from the height of 1,600m upward. In 2012, Tay Con Linh also had ice, making this place as beautiful as Norwegian forests. Dong Van, Meo Vac (Ha Giang) is also famous for ice that also appears in the high mountains of Ha Giang, including Dong Van and Meo Vac. Besides Dong Van town, visitors can go to many peaks in the communes of Lung Tao, Pho Bang, Lung Cu, Ta Lung, Thai Phin Tung in Dong Van district or Can Chu Phin, Giang Chu Phin, Thuong Phung and Xin Cai in Meo Vac district to see snow and ice. Recently, due to the influence of cold air, snow was 4-5cm thick in many places in Dong Van and Meo Vac. It is not always snow falls so don't take your time, pack your bag and go right now. See more Sapa Classic Tours to help you much.